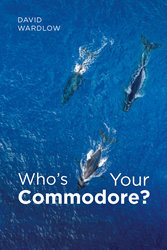 Recent release “Who's Your Commodore” from Page Publishing author David Wardlow details the idea of a profound change and a healthy practice of control. David Wardlow has completed his new book “Who's Your Commodore”: a riveting story that sends a message of exercising “seniorship” instead of “seamanship”. David was born the son of Ila Mae and Louis Melvin Wardlow at Fort Meade, Maryland. Lou was career army. This branded him an army brat with no particular place to call home. Moving seemed a pastime, always having to adjust to a new environment: Fort Meade, Maryland; Leavenworth, Kansas; Kaiserslautern, Germany; Lawton, Oklahoma; Aschaffenburg, Germany; El Paso, Texas; and finishing high school in Topeka, Kansas. Then he enlisted in the United States Marine Corps. On to Camp Pendleton; Okinawa, Mount Fuji, Japan; and Vietnam. He returned to San Diego by ship and was discharged after three years. After returning in country and being treated like an alien in his own country, things changed. Finally, he found solace by becoming invisible as that of the army brat and not standing out. He did not make a diary. He has come to realize that his two dark brown eyes are connected to his personal flash drive. He does not have any tattoos to reflect his feelings or memories, or piercings to make a statement. He does have scars from his journey, which are hidden so as to not bring attention. This story is David’s attempt to share a short part of the journey which could not have happened without walking the path of his life. Published by New York City-based Page Publishing, David Wardlow’s compelling account expresses the frustration of the past with no true direction and the changing of the guard to a new and steady course. With the climate of the current political system changing in this country, it seemed there was a need to share this story. Most boards are governed by Robert’s Rules of Order and their bylaws supported by their SOPs (standard operating procedures) to keep continuity for their future. Board differences are their types: nonprofit, business for profit, homeowner association, philanthropy, etc. Basically, they are here for solving and resolving their issues in a manner with control. They are not for creating chaos. It is interesting that personalities overshadow this reality when all the tools are in place. A decision was made to put this in writing to purge the soul, hopefully shedding some light on what can happen when in control versus when out of control. This is a four-year journey. With that being said, this plays to a much larger audience than just yacht clubs. Readers who wish to experience this timely work can purchase “Who's Your Commodore” at bookstores everywhere, or online at the Apple iTunes store, Amazon, Google Play, Kobo, or Barnes and Noble.